Witness the magnificent beauty of the mountains and jungles of Puerto Vallarta from the air as you take a short flight to the village of Mascota, the hub of a rich farming valley surrounded by lush pine-and-oak forested ridges. Tour the cobblestone streets of this colonial town (established in 1592) and visit a local Raicilla (a moonshine Mezcal) distillery. 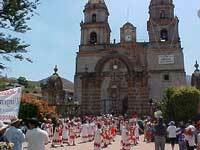 Then it's on to the amazing Talpa de Allende, famed for its beauty and religious significance. After touring the churches and town of Talpa, we'll fly back to Puerto Vallarta. This is a unique opportunity to experience "Real Mexico", far away from the resorts and tourists. Cruise Passengers: Yes! This tour makes a great shore excursion. Available for small groups! Runs: Wednesdays at 11:00AM. A Monday tour may be available for groups of 8 or more. 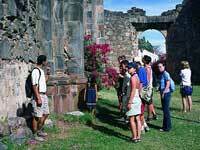 Includes: Lunch, Soft Drinks, Flight to Mascota and Talpa, Transportation in Mascota and Talpa, and tour of the villages.